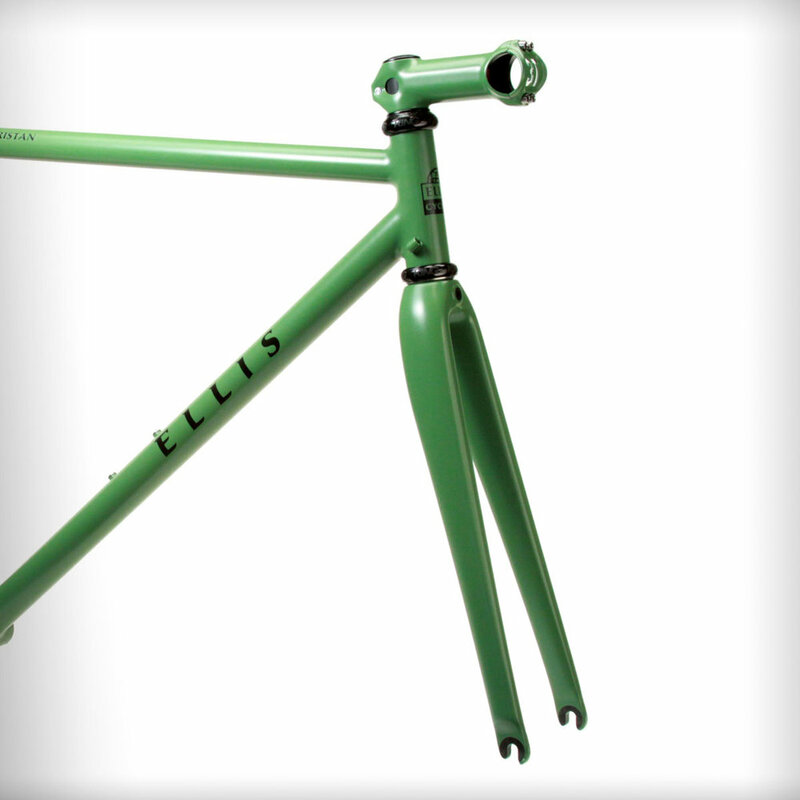 We have no "stock" frames: all Ellis frames are custom - built to your specifications. 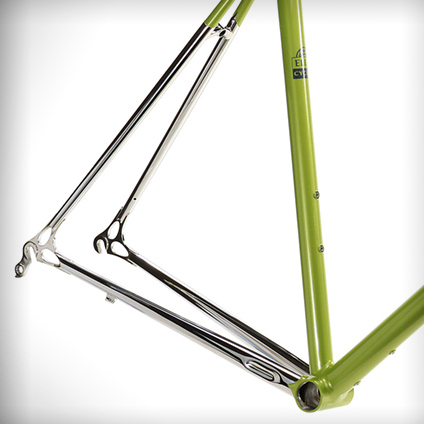 All frames come with our signature Ellis stainless dropouts and single color paint. The extras listed below are some of the most common requests we've had over the years. We use a stainless guide to cleanly route brake cables. The top tube remains completely sealed against weather. If you're craving the look of chrome, but don't want the hassle, this the perfect upgrade to your frame. Available on all lugs except bottom bracket. 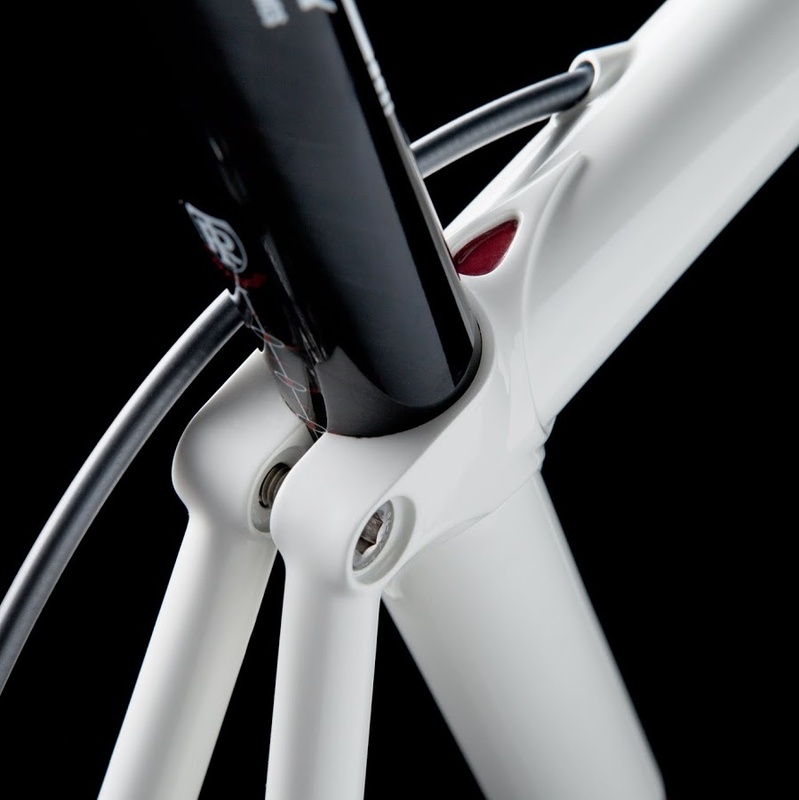 A painted stem is a great way to "finish" your custom build. This pictured stem has gold, black, and silver pinstripes to match the frame, but a solid matching color looks great and is a bit more affordable. I like Ritchey stems, but can source just about anything you desire. If a steel fork just isn't for you, I offer carbon forks from ENVE, Ritchey and Columbus. Painted along with your Ellis frame they are a perfect match. Depending on your ideas and budget, the sky is the limit with paint; adding a second color for a simple panel or contrasting head tube starts at $200. Chris King headsets are the industry standard and offer years of trouble-free service. Engineered, manufactured and assembled in Portland, Oregon. Titanium (pictured) is a great option for frames with polished stainless lugs. If you travel by air to ride, you have three options: rent a bike at your destination, pack your bike in a box and pay exorbitant fees to the airlines, or get a coupler bike. Coupler bikes break down and fit into a case that isn't oversize, so you pay the standard fee to check a bag. They can easily pay for themselves, have virtually no impact on ride quality and add just a few ounces. Stainless chainstays don't just look great,they're a perfect way to avoid chipped paint during wheel changes or due to chain slap. Both the chainstays and dropouts are polished to a mirror shine and then masked off for paint. Capture the classic look of a chromed rear triangle, but with modern materials and no headache. Stainless tubing and my signature "sleeved" seatstays allow for a perfect transition from paint to polish. Schmidt dynamo front hub is extremely reliable and has very low drag. Made in Tübingen, Germany, the hub is quiet and is designed to give thousands of kilometers of trouble free riding. $195 option for your Ellis fork; compatible hubs start at $250. I'm happy to quote pricing for a full wheel build. Every rando bike is a bit different, and so are rando racks. They can range from the simple and functional to fanciful artwork like the one shown here. Designs vary based on brakes, light mounts, fender connections and type of bag. Prices vary depending on the complexity. The crowning touch for your new rando bike!